WASHINGTON (AP) — President Donald Trump’s immigration crackdown has produced a spike in detentions by deportation officers across the country during his first months in office. At the same time, arrests along the Mexican border have fallen sharply, apparently as fewer people have tried to sneak into the U.S. 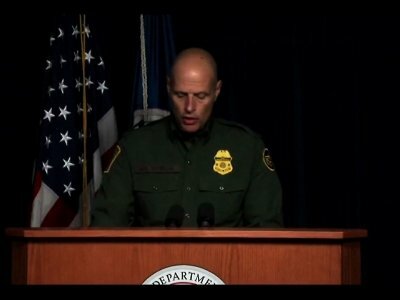 Figures released by the Department of Homeland Security on Tuesday show Trump is delivering on his pledge to more strictly control immigration and suggest that would-be immigrants are getting the message to not even think about crossing the border illegally. Even as border crossings decline, however, Trump continues to push for his promised wall along the border — a wall that critics say is unnecessary and a waste of cash. The new numbers, which offer the most complete snapshot yet of immigration enforcement under Trump, show that Border Patrol arrests plunged to a 45-year low in the fiscal year that ended Sept. 30, with far fewer people being apprehended between official border crossings. In all, the Border Patrol made 310,531 arrests in fiscal 2016, down 25 percent from a year earlier and the lowest level since 1971. Officials have credited that drop to Trump’s harsh anti-immigration rhetoric and policies, including widely publicized arrests of immigrants living in the U.S. illegally. But Mittelstadt also stressed that the numbers are part of a larger trend that began well before Trump’s inauguration: Mexico’s improving economy and more opportunities at home have stemmed the tide of people flowing across the border for work. “You’ve really had a realignment in migration from Mexico,” she said, noting that the numbers of Mexicans apprehended in 2017 fell by 34 percent from the previous year. The decline in border crossings continues a trend that began during the Obama administration, and marks a dramatic drop from 2000, when more than 1.6 million people were apprehended crossing the southwest border alone. Overall, U.S. Immigration and Customs Enforcement said, deportations over the last year dropped about 6 percent from the previous year — a number tied to the sharp decline in border crossings as well as a backlog in the immigration courts that process deportations. But that number masks a striking uptick in arrests away from the border. Those arrests have sparked fear and anger in immigrant communities, where many worry the government is now targeting them. ICE said the number of “interior removals” — people who are apprehended away from the border — jumped 25 percent this year to 81,603. And the increase is 37 percent after Trump’s inauguration compared to the same period the year before. In February, former Homeland Security Secretary John Kelly, who now serves as Trump’s chief of staff, scrapped the Obama administration’s policy of limiting deportations to people who pose a public safety threat, convicted criminals and those who have crossed the border recently, effectively making anyone in the country illegally vulnerable to apprehension. Trump campaigned as an immigration hard-liner, accusing Mexico of sending rapists and other criminals to the U.S. and promising to build “a great wall on our southern border.” As president, he has signed a series of travel bans aimed at curtailing who can enter the country, pushed to overhaul the legal immigration system and tried to crack down on so-called sanctuary cities that refuse to share information about illegal immigrants with federal authorities. He has also pushed for funding for his border wall. The new numbers, which include the last months of the Obama administration, provide new ammunition to Trump critics who question the need to spend billions of dollars on a border wall if crossings are already dropping. But officials insisted the wall was still needed. “Yeah, the traffic is down. That’s a good thing,” said Ronald Vitiello, the acting deputy commissioner of Customs and Border Protection. But, “to take the 1,000 arrests a day to say that we’re finished, it’s not stating what the facts are. We’re still arresting nearly 1,000 people a day coming across the border,” he said. Democratic Rep. Bennie Thompson of Mississippi saw it differently. Despite the overall decline in border arrests, the numbers have increased every month since May and many of those apprehended have been families and unaccompanied children. The actual number of illegal borders crossings isn’t known because many people slip in undetected. Immigration authorities caught just over half of the people who illegally entered the U.S. from Mexico in 2015, according to a report commissioned by the Department of Homeland Security. That’s much lower than the success rate DHS had cited publicly. South of the Arizona border in the Mexican town of Nogales, many of the deportees who were eating breakfast Monday at a dining room run by a nonprofit group had been picked up in the U.S. far from the border. “We are seeing a lot of people now who have long established ties in the United States,” said Joanna Foote Williams, the Kino Border Initiative’s director of education and advocacy, as about 40 men and a few women ate eggs, refried beans and tortillas.